"Today I passed a Ginkgo tree at school. Its leaves have just recently come out. Since I am a particular fan of ginkgo trees, I decided to pick a leaf. 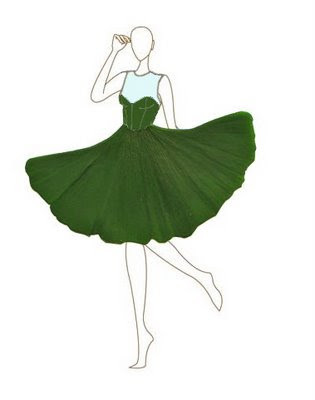 Then I thought, going with the idea of nature-inspires-fashion, this leaf looks quite like a skirt... Hmm. So I scanned the leaf and photoshopped the stem out of the image."